The Long's were looking for a striking design for their new bedside tables to complement their collection of fine art. Hand-cut dovetails join the casework, and show through the top. Ogee molding is attached around the top with dovetailed cleats. Shop-made custom Walnut pulls add an oriental touch to these hand crafted tables. 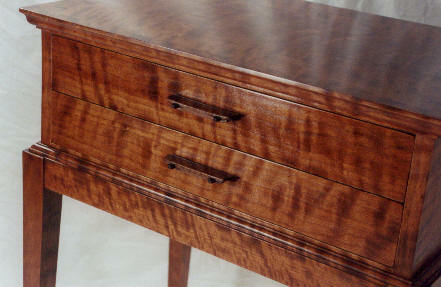 This pair of bedside tables showcase Figured Cherry with a custom aniline dye.